Architect Rogelio Gula gives an overview of plans for 681 Florida Street. 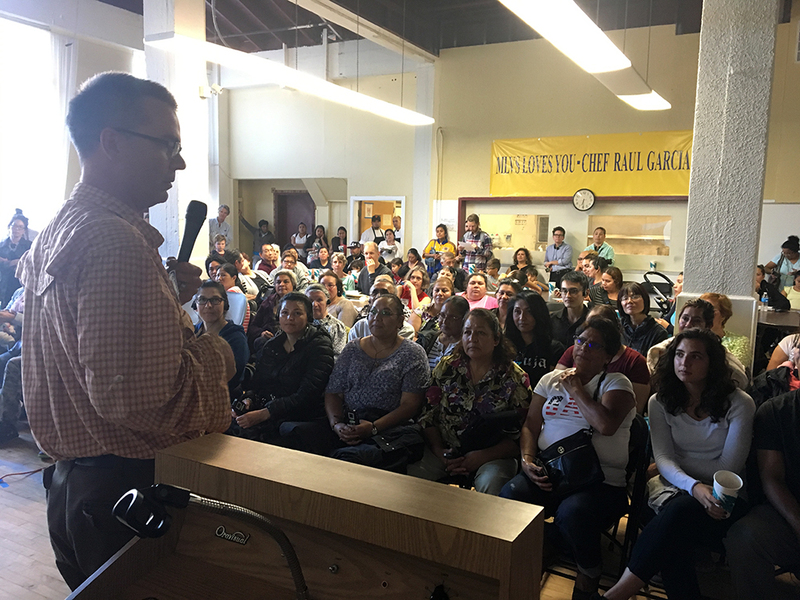 For the crowd of around 100 people who filled the auditorium of the Mission Language and Vocational School Wednesday night to hear the plans for an 130-unit affordable housing building, it couldn’t arrive fast enough. This kind of community input meeting, where developers pitch their proposed building, usually draws small groups of immediate neighbors who critique the height of the buildings, design and amenities (parking is a popular one). But at the meeting for 681 Florida St., most of the largely Spanish-speaking crowd wanted to know only one thing: how to get housing. The proposal promises units ranging from studios to three-bedrooms that will be affordable to those making up to, or less than, 60 percent of the Area Median Income — about $62,000 a year for a family of three, and $48,400 for an individual. The preliminary design boasts multiple outdoor areas, including one on the roof. Laundry will be housed on the roof, as will a community garden and a lounge area. The entire ground-floor commercial space is slated to be reserved for arts groups, 115 bike storage spaces and two offices for social workers. “Can we apply at MEDA?” one person wanted to know. 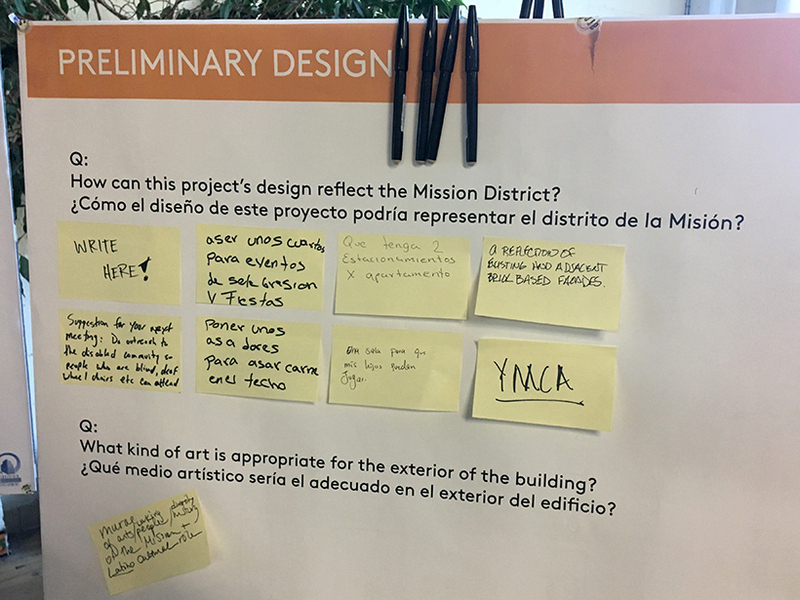 The Mission Economic Development Agency and Tenderloin Neighborhood Development Corporation are collaborating on the construction of the property. MEDA will remain the owner and TNDC will manage the property, which will also provide social services to tenants. The lottery for placement at 681 Florida, however, will not open for several years. Construction is expected to begin in January 2019, and leasing a year later. “Is there any way to speed up the building process?” asked one person, one of the few who posed their questions in English. MEDA’s Feliciano Vera from the nonprofit’s real estate team said they were trying to accelerate the timeline, which is in the pre-construction phase. Environmental approvals have already been secured and the nonprofit is trying to get its community outreach done ahead of schedule. Permits and financing, however, still need to be finalized. The developers, for their part, had hoped to solicit some design input — rather than a flood of applications. Dairo Romero, another member of MEDA’s real estate team, stressed the importance of giving the community a sense of involvement in the development process. A few suggestions were conveyed through sticky notes left on a poster soliciting input, and in a question-and-answer session. One person asked to shift the unit balance toward more three-bedroom units, to accommodate larger families. Rogelio Gula, a principal at Mithun Architects, which is designing the building, said after the meeting that three-bedroom units are particularly tricky to accommodate; two-bedrooms are a little easier. “That unit mix is slightly flexible, but the three-bedrooms are the most challenging,” he said. Otherwise, feedback ranged from a few questions about parking (there will be none) to flooring materials due to a child’s asthma (a wood-like flooring, no carpet) to someone who wrote a note suggesting adding a grill to the roof deck. I agree no carpet because some children have asthma. Hardwood floor is too cheapy.. travertine may work but only 100% from Italy… Chinese has radon.